The DCF works like this. These are clones of stable (mostly) repraps, destined to be used as repstraps. The clones allow for bootstrapping by speeding up production time. 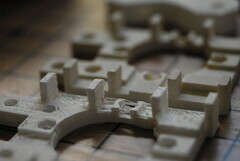 The goal is not to replace reprap, but assist in the proliferation of 3D FDM printers. 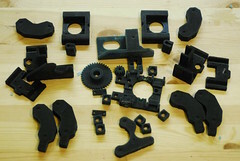 Clones are much more affordable than other commercially available kits and solutions, and are closer to the source, so more parts can be shared from the repstrap to the reprap. Additionally, all source files, (solid models, molds) are available. Depending on the resources available to you, it is easy to join the DCF. 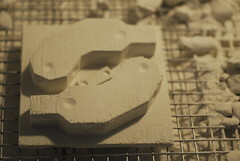 If you have a powder printer, you have the ability to print molds. We will be adding workflow to bring your costs down. We are looking for a HUB on every continent to reduce shipping costs and distribute the factory. If you belong to a hackerspace, you have the ability to become a DIST. You can use the DCF to raise funds by selling parts on eBay or holding workshops in reprap or the production of repstrap clones. We will be posting further documentation on both pouring and workshop materials. Stay tuned. If you want to be a full service DIST, you should carry commodity materials which should be available locally. If you are interested in being an END point for a clone, all you have to do is find a DIST, get your commodity materials (motors, hardware and electronics) and assemble. action -> positive print, wax, box, create mold. 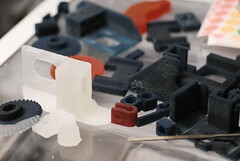 Materials: You can use any number of pourable plastics or epoxies. We are currently using Smooth-on 325, which is a clear (but tintable) 2 part RTV urethane (1:1) with nice strength and a fast cure time, If you are looking for opaque parts, we recommend smooth-on 300. If you want your molds to last a long time, it is recommended that you use a mold-release, or PAM spray in a pinch. Smooth-on comes in a variety of container size, including a 55gal drum with prices adjusted accordingly. The trial size costs $22 at the local Blick store. 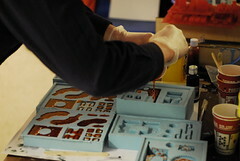 You can pour a full set of parts with a trial size set. The current set takes ~620cc worth of material, and we pour in 100cc volumes using two 60cc veterinary syringes (50cc ea.) to mix. If you buy the gallon set, you should be able to get 10 clonedels out of it. Pouring is relatively simple, but can be messy. You should make a clean work area, and cover it with PE butcher paper, or a throwaway drop cloth. Approach this like cooking, do all of your prep first, then move fast when it comes to the pour. If you need more working time, you can switch to a different formula of urethane with specs you are comfortable with. Smooth-on working time estimates are based on 100cc, so pouring in small increments is recommended. Larger volumes give you less working time. There are videos on the smooth-on website that are worth watching to determine best practices. Gloves, ventilation and patience are all needed. 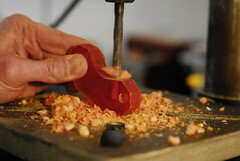 A drill press is recommended, although you can use a handdrill and a vise in a pinch. The dimples in the clone parts are provided for your convenience. You can decide to make your clone in metric or SAE depending on which you (and your wallet) prefer. It is recommended that you pick up a cheap tap set for set screws and to prepare yourself for future improvements. 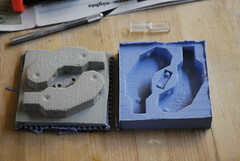 action -> print next gen from reprap tree.